Start with a pair of shoes with at least 1/2 and inch of rubber sole and a round plastic container I think mine was from a powdered juice container. Cut up a plastic container into a hoof shape. The plastic is then nailed into the rubber sole of the shoe. I sculpt up the hooves further to get a cloven shape. I use a modeling air dry compound called delight, however there are many different materials you can use to sculpt with. Delight takes a few days to dry. Once it does, I add another layer to and use a popsicle stick to create ridges and texture. Using a mixture of Black paint and rubber latex (When adding black to latex, the color will always appear lighter than the final product, this is because Latex is white when wet, but dries clear. If you are unsure on the color paint a thin layer on a test piece of paper and let dry to determine if the color is right for you. I add several layers of latex to the hooves. You may have to add as many as 10-20 coats of latex to get a good sealed surface. I am using an old pair of stetchy exercise pants for my base. You can sew some from scratch if you desire, however sometimes using an old pair of comfortable pants is easier. 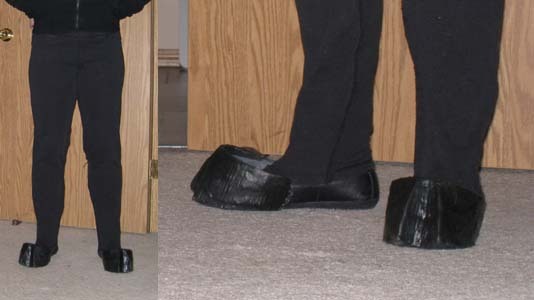 The pants are sewn directly into the shoes. You will need to carve 3 different shapes (one for each leg) from upholstery foam. I use 4" Upholstery foam you can find at your local Walmart or Fabric store. Once the foam is carved, I make little pillowcases for them. You do not have to do this, however it makes it easier to sew them into the pants. Using a thick thread (a polyester thread for sewing coats works well), I hand sew the padding to the pants. The easiest way to sew the padding is to use a duct-tape dummy, or to pull on the pants and sew the padding on while you're wearing it (be warned, you'll poke yourself with a needle a lot). Now you need to draft a pattern for the fur. The easiest way to draft a pattern is with Duct tape! 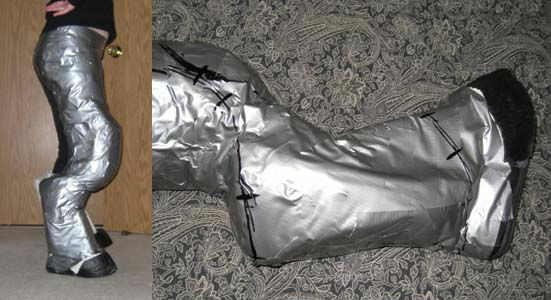 You only need to duct tape one leg for this, so you should be able to do it yourself. Don't worry about being too accurate, as most faux fur is somewhat forgiving. Try not to get any duct tape on the latex however, it can cause the latex to peel off a little. 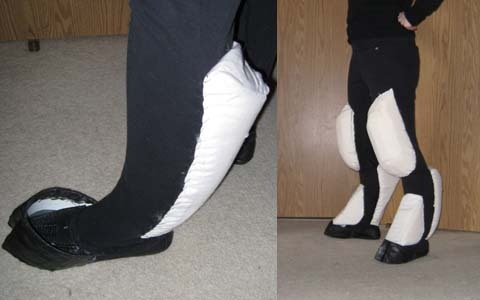 I used a small strip of fabric along the hoof line to deal with this. You should be able to slide the pants off, even with the duct tape. Draw lines where you want to cut the pattern. My legs will be grey with white patches. 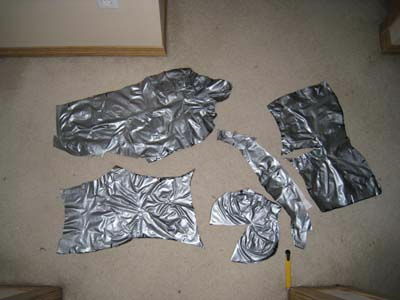 Once you cut the fur off the pants, Lay out your pieces on the carpet to help reduce some of the stick from the duct tape. Since you only taped one leg, you will have to cut 2 pieces of each. Remember when cutting the fur to add at LEAST a 1 inch around the patterns. This will give you some forgivement if you need to make some adjustments to the final fitting. Once your fur pieces are cut, sew them together. Stuff your padded pants into the fur pants. You will want to sew the waist of the fur to the waist of your base pants. You will also want to sew the fur to the hooves. This may be accomplised by drilling holes 1/2 and inch to 1 inch apart along the top edge of your hooves. Carefully sew the edge of the fur to the hooves with a thick thread. Once sewn into place, I use some hot glue to further fix stitches in place. I have added a belt to the waist of my pants to act as a drawstring. Since my exercise pants do not have much elastic in the waistband, the belt helps hold them in place a little firmer, so I do not have to keep stopping to pull them up as I move around. Last, you will want to pull the seams of your pants. 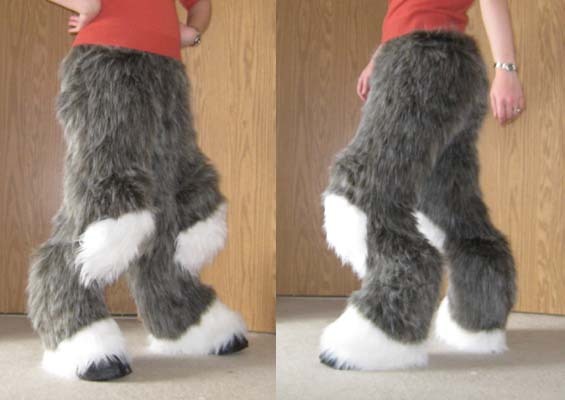 In order to hide the seams of your finished saytr legs, you can use a pet brush to help pull the fur from the seams, or you may wish to use a T-pin for more difficult seams. It may take awhile to pull all those seams, but the finished look will really shine through.